Over 15 years ago, I was a co-author of a book called ‘Upside Down Management – revolutionizing management and development to maximize business success’ McGraw-Hill Europe, 1995. At that time, I was concerned that our organizations were too rigid, structured, linear, and information based, and what we needed to better understand was the need, in a growing global knowledge society, for our organizations to become more like organisms. Organisms are flexible, holistic, fluid, dynamic, and knowledge based. I said at the time, People are organisms! People are very complex organisms. I started to look for better ways to develop and apply effective knowledge working competencies within, and between people, as knowledge based organisms. Over 10 years ago, my company Knowledge Associates International, was part of a 2 million euro European Commission funded project and European collaborative research and development consortium, called 'Know-net' , to develop a holistic framework, methods and tools around the concept of Knowledge Asset Management. The detailed research proceedings are published in the book Knowledge Asset Management – beyond process centred and product centred approaches’, Springer 2003. At that time, I had developed and implemented effective knowledge working competencies frameworks, systems and tools in organizations around the world. And I was happier with frameworks that were more holistic and knowledge asset centric. But I was most concerned with the different levels of effective knowledge working within and between knowledge driven and knowledge based organizations. In most organizations, I saw ‘organizational’ knowledge management initiatives. In many organizations, I saw ‘team’ knowledge management initiatives. In some organizations, I saw ‘personal’ knowledge management initiatives and, in some organizations, I saw ‘inter-organizational’ knowledge management initiatives. All of the above initiatives were very well intentioned, and without doubt, gave some benefit to the organization. But they didn’t seem to go any further than one or two dimensions. What seemed to happen is that a KM strategy was developed along one of these dimensions, as the focus, as the imperative, but there it seemed to end. Either the initial KM champion left the organization, or the results from the initiative were found to be mediocre at best, and even failure at worst. I felt that this was very sad indeed. In many instances, I knew that organizations were ‘throwing the baby out with the bathwater’. The outer ring of the framework is referred to as the ‘knowledge networking levels’, the interdependencies of which facilitate the natural emergence, leveraging, and flow of knowledge and knowledge assets. We recognised four levels of knowledge networking: individual level, team level, organizational level, and inter-organizational level. These knowledge networking levels surrounded the four inner ‘KM Infrastructure’ components: strategy, structure, processes and systems, which, in turn, surrounded the organizations key knowledge assets, as the primary focus. It was our view that any organization that considered knowledge to be a key asset, or even ‘the key asset’, needed a compelling and holistic organizational knowledge asset centric framework and strategy to successfully implement the principles, processes, methods, tools and techniques in all of these four knowledge networking levels and dimensions of effective knowledge working. Many organisations have only partially focused on this critical issue to date. 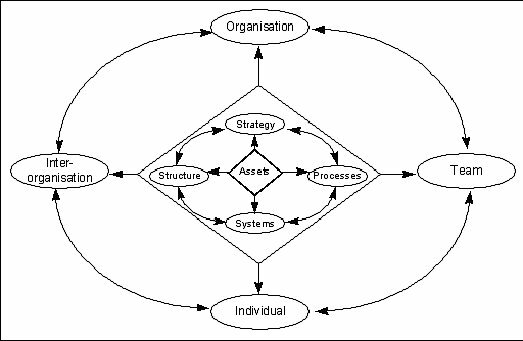 Furthermore, the strategies, processes, methods and tools are situational, and will, therefore, vary according to each organisation, and to each of the four dimensions. Therefore, the purpose of this paper is to provide insights and a deeper understanding of each of the four dimensions and, most importantly, a better understanding of the inter-relationships between the four critical dimensions of successful knowledge management – personal, team, organisational and inter-organisational. Let’s first take a deeper look at each of the four dimensions separately. A number of organizations have implemented a KM strategy for personal knowledge management. This is a ‘bottom up’ approach and comes from the belief that by improving the personal ability of employees to better identify, capture, store, share and apply their personal knowledge, this will inevitably result, as an automatic outcome, in better knowledge management at the team, organizational, and inter-organizational levels. The other driver for personal knowledge management is the growing need, for many individuals and organizations, to better tackle ‘information overload’ and make more sense of our world, to develop more focus, to become more proactive in task prioritization and decision making, to better manage time and projects. This also comes from the realisation that this will reduce stress, increase personal creativity and productivity, and lead to greatly improved work-life balance. The personal, or individual level refers to the personal knowledge, capabilities, experiences, competencies and personal development issues for each individual knowledge worker.Therefore, the strategies, methods and tools used for this dimension are at the personal level, and include methods and tools to personally capture, learn, interpret, envision, analyse, synthesize, communicate, create, share and apply. I am convinced that personal knowledge management is the most essential life skill for the 21st century for the knowledge worker. A number of organizations have implemented a KM strategy for team knowledge management. This is an approach that comes from the realisation that teams are ‘the key knowledge work units’ or knowledge engines of the organization. It has been recognized that a team that ‘collaborates’ well transfers knowledge between members much faster, and, as importantly, is a powerful creator of new knowledge. Project team leaders can now produce new knowledge as a key deliverable, as well as, and alongside the traditional project deliverables. Team knowledge management, therefore, is based on ‘Share’ or ‘Pull’ models of information and knowledge transfer, as opposed to the overused ‘Send’ or ‘Push’ models that create information overload. It is also based on team knowledge plans. With the introduction of powerful collaborative team technologies, in the late 1980’s early 1990’s, it became possible, for the first time, for more effective collaborative virtual and cross functional team working across organizations and across the globe. As with personal knowledge management, team knowledge management has been greatly accelerated by mobile, wireless and web-based tools communication and collaboration tools. At this stage, it should be mentioned that the dimensions of both personal knowledge management, firstly, and team knowledge management, secondly, overlap heavily with the notion of the ‘Learning Organization’ and the need to develop, at a personal level, the five learning disciplines of personal mastery, mental models, shared vision, team learning and systems thinking . This is described in more detail by Peter Senge in his landmark 1990 book, The Fifth Discipline: The Art and Practice of The Learning Organization. Most organizations have first embarked on an ‘organizational knowledge management’ approach. The intention being to introduce a KM strategy and a supporting infrastructure for better creating, storing, sharing and apply knowledge across the entire organization. This approach is primarily a ‘top down approach’.It starts by identifying the key knowledge assets, or critical knowledge assets of the organization that are needed to achieve its objectives, and then sets out to develop and leverage those assets as fast as possible. To do this, the organization sets up an organization-wide infrastructure to enable the identification, capturing, storing, sharing and applying of knowledge, retention and the re-use of knowledge assets. More continuous and collective processes, to capture new learning’s and ideas before, during, and after work events, and then turn them into good practice and knowledge repositories are implemented. Organization-wide expert locators, and communities of practice, to accelerate knowledge flows, are developed. The level of inter-organizational management refers to inter-enterprise relationships and knowledge value networks and partnerships. Hence, knowledge networks with customers, suppliers, partners, competitors, sub-contractors, stakeholders etc. Some organizations have embarked on these relationships at a global level, for example, inter-governmental agencies, United Nations agencies, regional knowledge networks and knowledge clusters, and the development of common national knowledge platforms etc. Inter-Organizational knowledge management is based on the realisation that the most valuable knowledge sources and resources can be, and probably are, outside your own organization. Commercial organizations and educational establishments are increasingly co-partnering with customers, suppliers and even competitors, to collaborate, share and develop new knowledge and innovative products and services, together as one. Naturally, the global World Wide Web has enabled a common communications, collaboration, learning, information, and knowledge sharing environment. Global mass collaboration initiatives, knowledge systems and knowledge ecologies are now rapidly emerging for the common good. Knowledge Commons is a reality. As can be seen, from the brief descriptions above of each of the four dimensions, viewed separately, they are, each, very powerful in their own right. They are completely different in their approach. They tend to have quite different KM strategies and can use quite different methods tools and techniques to successfully be implemented. But they are not separate at all! They are all one and the same thing. They are one knowledge entity made up of individuals! The only thing that is different is the scale of the knowledge entity. Going back to my earlier concern, we must not put people, who are highly complex organisms, into classical limiting organizational structures and expect them to perform at their best. Importantly, each part, each person, each dimension, is related to each other part, person and dimension, and to the whole.As you improve any part, so you improve all the other parts, and the whole. It is impossible not to do so. Each part is vital to the whole. This results in a virtuous, or upwards spiralling path of increased value. More importantly, if any part is missing, it disables the whole from achieving its overall effectiveness. This can result in a vicious, or downwards spiralling, path of decreased value. They are vibrant knowledge ecologies. If you examine, in more detail, the characteristics of each dimension you will discover that they are all vital to the whole, but no one dimension is complete. Nothing, ultimately, should be omitted. For example, the most common mistake is to embark on organizational knowledge management, with its espoused organizational benefits, without any real individual benefits and personal knowledge management. People, in this case, treat KM as yet another organizational initiative and there is no, or very little, motivation, no clear ‘what’s in it for me’, no sustainability. This is doomed to eventual failure. As another example, if the organization embarks only on personal knowledge management, it can only go so far before it reaches its personal limitations in scaling and working across the entire organization and with its stakeholders. This can bring reasonable results, but only mediocre results compared to what is really possible. If an organization embarks only on team knowledge management, it will miss the extra powerful benefits that personal knowledge management brings to the team, and the benefits from an enterprise wide organizational knowledge management infrastructure. It, too, will also only go so far before it reaches its team limitations in scaling and working across the organization and its stakeholders. If an organization embarks only on inter-organizational knowledge management, without the benefits from personal, team and organizational knowledge management, it will certainly reach limitations and produce mediocre results. But effective knowledge management can and should produce extraordinary results! Extraordinary knowledge management results require a KM strategy that is designed to develop, ultimately, a synthesis from, and between, each of the four critical dimensions in the knowledge networking levels. Extraordinary knowledge management requires a holistic approach. The sum, the emergent properties from the whole, will be so much greater than the parts! So is it simply the case that we only need to recognize this holistic approach and implement it, in all four dimensions to achieve extraordinary knowledge management? Is there a more important dimension, or sequence of dimensions, to implement before others? Are their any tools and techniques to help us? The key to implementing successful knowledge management, or any new initiative you can think of, at any level, is to be able to demonstrate, without doubt, clear business value. By business value, I mean that the business benefit clearly exceeds the cost. If there is clear business value, there is no final cost. Rather, it is a cost not to do it! Every sensible senior manager, of any business, will wholeheartedly support accelerated business value. So, for knowledge management initiatives, I recommend ‘value frames’ which are small discrete packets of work, normally of a relatively short duration of weeks or months. Each value frame of work has a mutually agreed business value and an agreed method for measuring it. At the end of the value frame of work, there is a value assessment. If the value is achieved or exceeded, the next value frame of work can be agreed. The first value frame could be the knowledge management vision and/or strategy, taking all four dimensions of knowledge management in to account, for the senior management to approve. A value frame could be a work plan. It would contain an initial assessment of the number and type of value frames required for a major KM project. Working with discrete value frames is an iterative process. It is a methodology that can lead to accelerated value in the organization. Requirements will most certainly change as a result of learning. Initial value frames of work from the initial work plan will be refined and, sometimes, redefined or even deleted. New value frames may be added. Most importantly, because each value frame is relatively short, the risk to management is only one value frame. Furthermore, with relatively short discrete value frames of work, the organization will deliver and receive very quick business value wins. After successfully delivering value to management by developing a KM vision, linked to the organizations vision, and a KM strategy and work plan, a KM pilot value frame should be developed and agreed around personal and team knowledge management . In this case, a pilot business area, normally a project or business process, and team should be selected. It is suggested that the KM pilot period is not less than 6 months duration, to allow sufficient time for teaching and applying both personal, and team knowledge management competencies, methods and tools. The value for the KM pilot as a success, as for all value frames, must be mutually agreed and measurable. There are a growing number of personal and team KM pilot measurement tools available. With a successful KM pilot value frame completed, the pilot team will be your best, and most natural, change agents to the rest of the organization. When sufficient personal and team value frames have been completed (some organizations are happy with just one demonstrable pilot at this level, but others may require several successful pilots around the organization), a more detailed, overarching knowledge management infrastructure value frame of work can commence. This will then enable the organization to embark on value frames of work at the organizational knowledge management level.Finally, the demonstrated value achieved at the personal, team and organizational levels can be extended to value frames of work at the inter-organizational level. Throughout, personal motivation and knowledge working competence, together with team motivation and knowledge working competence, is fuelling organizational and inter-organizational knowledge working competence. Throughout, measurement tools and techniques, and reporting systems can be employed to clearly demonstrate the value gained for the organization. This is putting the ‘horse before the cart’. So many knowledge management initiatives, that I have observed, have been only organizational methods and technology driven. They are top down only. They have put the ‘cart before the horse’. To continue the analogy, ‘you can take a horse to water but you can’t make it drink it unless it wants to’. The above suggested sequence of implementing the four dimensions of knowledge management is not the only sequence. The above strategy and method of using value frames, for risk assessment and iterative development, that embeds continuous learning as it occurs, is not the only strategy and method. But it is a sequence, strategy and method that works. It will produce extraordinary value and extraordinary knowledge management if it is applied properly. I also positively challenge every organization that is interested in successful, effective, and extraordinary knowledge management to ask itself if it is applying a holistic approach to all the four dimensions that are discussed in this paper? Is the organization achieving increased value through a virtuous upward spiral of effective knowledge working? I also challenge organizations that seek external help from knowledge management consultants to ask the consultants to demonstrate the value and benefits they are gaining as individuals and teams, at least. If they cannot, then please run away as fast as you can! I have the great privilege in 2010 and 2011 to conduct public master classes in ‘Understanding the four dimensions of knowledge management’, and private organizational workshops, across the world for KM practitioners, organizations and institutions. Classes and workshops have been run and are scheduled in Europe, Asia and the USA. In these master classes and workshops we explore and share together successful strategies, methods, tools and experiences. We discuss and share our collective knowledge and experiences to better achieve organizational results through effective knowledge management. I hope you find this paper of value to your understanding of effective knowledge management. I look forward to your feedback, your experiences, and even better ways to ensure that knowledge management, in all its dimensions, is achieved. Naturally, I will update this paper with new and better learning’s and experiences, as they occur.